HOUSTON (CN) – As Texas hurricane victims struggle to get back on their feet, legal-aid groups are helping them navigate a sometimes baffling federal-aid claims process and push back against landlords eager to evict them from flooded apartments. Melba Ponce, 65, doesn’t understand how the Federal Emergency Management Agency denied her claim for home-repair assistance. Ponce lives in Beeville, 60 miles northwest of where Hurricane Harvey made landfall near Corpus Christi as a Category 4 storm on Aug. 25. Harvey’s winds tore shingles off her roof, opening a small hole above her 6 and 7-year-old granddaughters’ room through which the sky is visible, and pushed water up under her home, rotting its wooden floors. “You can’t walk through there, because it has holes in the bottom and holes on top, this hurricane really messed it up worse,” she said in a phone interview. Ponce said she filed a FEMA claim and an agency inspector named John showed up punctually at 8 a.m. one recent morning, and saw the black mold growing on her home’s walls and the pots on her stove that she uses to collect rainwater. She said it has rained three times this week. John didn’t get on her roof to inspect it, she says. “He was too much in a hurry. Why? I have no idea. Maybe he was just in a hurry to go see some other houses, but he left quite fast,” Ponce said, guessing he was there for 30 or 40 minutes. Despite the fast inspection, she says, she was certain he had documented enough damage for FEMA to pay her claim. “I saw him measuring with a red laser and I said, ‘Oh I know I’m going to get some kind of help,’” she said. But FEMA denied Ponce’ claim after John decided she can still live in her house. “I don’t know how he can say that it’s livable when there’s mold and he saw it,” she said. More than 800,000 Texans have applied for FEMA house-repair assistance and it has paid out at least $630 million on those claims. Ponce is one of over 67,500 Texans whose claim has been denied, according to stats provided by FEMA. FEMA pays homeowners up to $33,000 under its Individuals and Households Program, offering aid for home repairs, rent for temporary housing and fare for hotel rooms, and emphasizes its benefits aren’t meant to cover all losses caused by a disaster. Ponce contacted Texas RioGrande Legal Aid and an attorney from the nonprofit is helping her with the appeals process. Ponce said Friday she’s going to go out and look for two contractors to give her estimates for home repairs, a requirement for the appeal, which must be filed within 60 days of a denial. Disabled from two total-knee replacement surgeries, Ponce collects gets less than $800 per month in Social Security and Supplemental Income Security benefits, and though her two sons also live with her, only one of them works because the other one also has problems with his knees. Tracy Figueroa is a staff attorney in Texas RioGrande Legal Aid’s Corpus Christi office. She said Harvey is the 15th natural disaster she has worked on with the organization. The president must issue a disaster declaration for counties before their residents can apply for federal aid, and 39 Texas southeast counties are now under the declaration. Figueroa and Texas RioGrande Legal Aid’s battles with FEMA go back to 2008 when Hurricane Dolly ripped up homes near the Mexico border, leaving residents in the Rio Grande Valley, one of the poorest regions in the country, with extensive home damage. Texas RioGrande Legal Aid sued FEMA on behalf of La Union Del Pueblo Entero, a community-activist group, and several homeowners, after the agency denied 14,900 claims for home damage caused by Dolly. The plaintiffs’ stories told in the lawsuit are similar to Ponce’s experience with FEMA. FEMA determined their homes were still habitable, even after a tree fell on one of them, and sewage backed up from a septic tank into another, and mold blossoms sent some people to the hospital with breathing problems. In denying their claims, FEMA often said the home damage was caused by “deferred maintenance” or a pre-existing condition, like a roof that has developed holes over the years because it has not been properly maintained. The homeowners claimed in their lawsuit that FEMA had used vague guidelines for evaluating their claims, and had relied on an “unpublished definition of ‘deferred maintenance’” to deny them aid. U.S. District Judge Hilda Tagle agreed in an order she wrote in February this year that FEMA should have disclosed the deferred-maintenance policy to the homeowners, prompting FEMA to drop the policy, but she found no fault with the agency’s guidelines for its agents to evaluate claims. After nearly a decade of litigating the case, FEMA paid the homeowners a settlement earlier this month, and will pay La Union Del Pueblo Entero in October or November, Figueroa said in an interview. Figueroa said Texas RioGrande Legal Aid is now helping people seeking FEMA relief for Harvey damage whose home-title issues are preventing them from getting aid. Figueroa said Texas RioGrande Legal Aid usually concentrates on helping poor South Texas residents with their legal needs, but after an Aug. 28 fire caused by Harvey burned down the headquarters of its sister organization Lone Star Legal Aid, in Houston, they’ve stepped in to fill the void. “We’ve been handling all their hotline calls. So we’re actually serving Houston, Galveston and Beaumont,” Figueroa said. 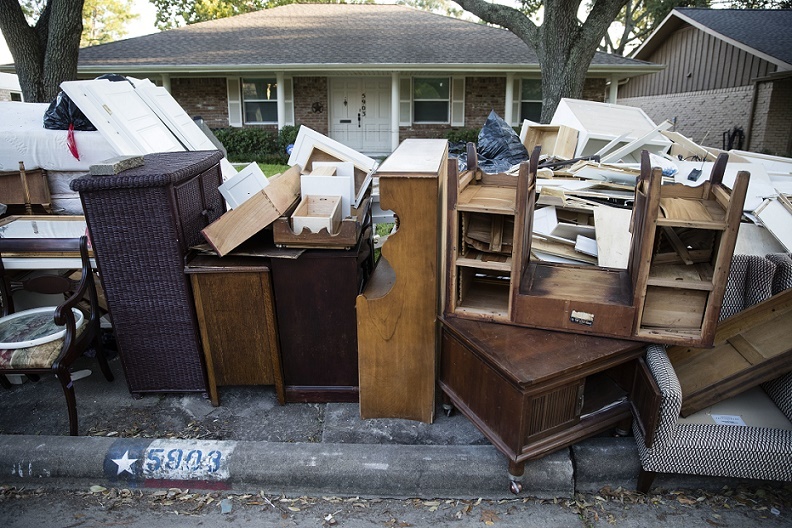 Even without a permanent office, Lone Star Legal Aid has been busy filing lawsuits in Beaumont and Houston against landlords who have asked renters of flood-damaged apartments to move out within five days. While the five-day deadline seems harsh, that’s a standard notice period in apartment lease contracts in Texas after a landlord deems a unit uninhabitable. Lone Star Legal Aid sued the Houston Housing Authority on Sept. 22 on behalf of three residents of a high-rise complex near downtown Houston whose residents are mostly senior citizens. Flooding from Harvey damaged the building’s electrical systems, which the authority says makes it dangerous for people to live there, and all residents got a five-day notice to vacate posted on their doors on Sept. 18, Lone Star Legal Aid said in a statement. The housing authority has since agreed to give the residents more time to move, and is paying their costs to move to other rental homes the city has found for them, local media reported. “This is the type of problem that made me want to be a legal aid lawyer; being able to help people who are vulnerable against the misuse of power,” Lone Star Legal Aid attorney Mark Grandich said in a statement. Jessie Campbell is the attorney engagement coordinator for the Houston Bar Association’s legal-aid arm, the Houston Volunteer Lawyers. Campbell said her group usually gets 6,000 volunteers a year, who donate a total of more than $5 million worth of billable time to pro bono cases and legal advice clinics. “And that’s before Harvey,” she said, noting that Houston Volunteer Lawyers had 1,000 volunteers sign up to help with Harvey-related issues. Campbell said her group’s volunteers have been manning booths at FEMA disaster-relief centers and shelters for people whose homes were damaged by Harvey, and the experience has been emotional for some attorneys. “I have a friend who volunteered at one shelter, who said she was doing it every day for a week, and she was just crying when she got home because she’s telling people that based on their immigration status they don’t qualify for assistance, or that because they had flood insurance that they can’t qualify for assistance,” she said. Campbell, who specializes in tax law, said the Houston Volunteer Lawyers are doing interviews and planning to add to their staff of 28 people. Ponce doesn’t have to worry about being evicted from her home in Beeville, but she said she’s worried about the sinus problems and frequent colds her granddaughters have developed since Harvey tore off the roof and mold infested the walls. She said her house is ripe with the smell of dead rats and she’s taken pictures of rat feces in the house to include with her FEMA appeal, but she can’t afford to move her family to a hotel room. “Oh it’s so scary and I don’t even want the girls to see that because I’m scared myself,” she said about the rat droppings. Ponce said she has little confidence that FEMA will give her any money to repair her house, but she has no choice but to appeal her claim denial. Texas RioGrande Legal Aid can be reached at 1-866-757-1570.